Vega in all her glory before the disaster. Vega after falling from her cradle whilst being hauled out of the water for dry docking. Children on the Banda Islands. 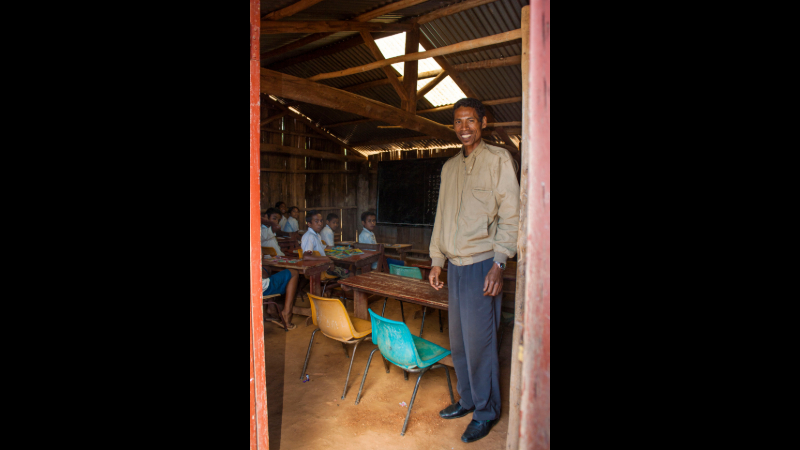 A community-built school in East Timor. 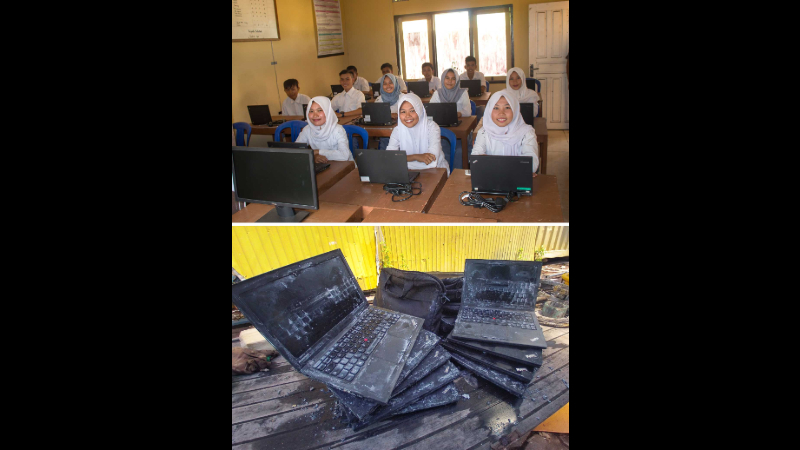 Laptops used to train teachers. 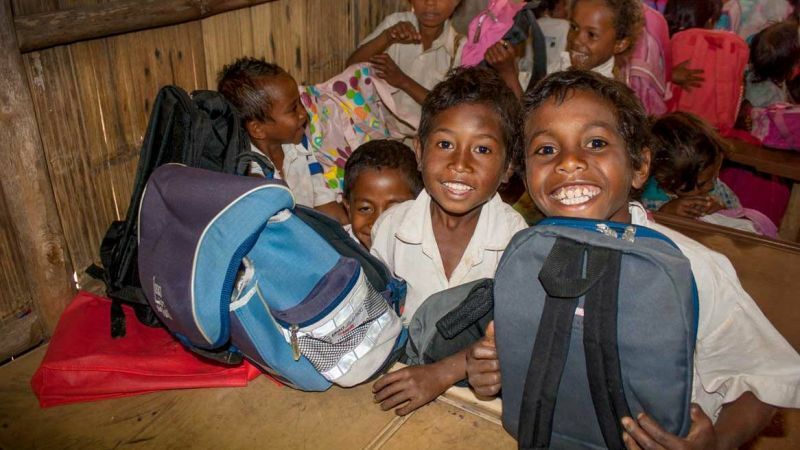 Every year Vega collects and delivers 15-20 tonnes of donated educational and medical supplies. 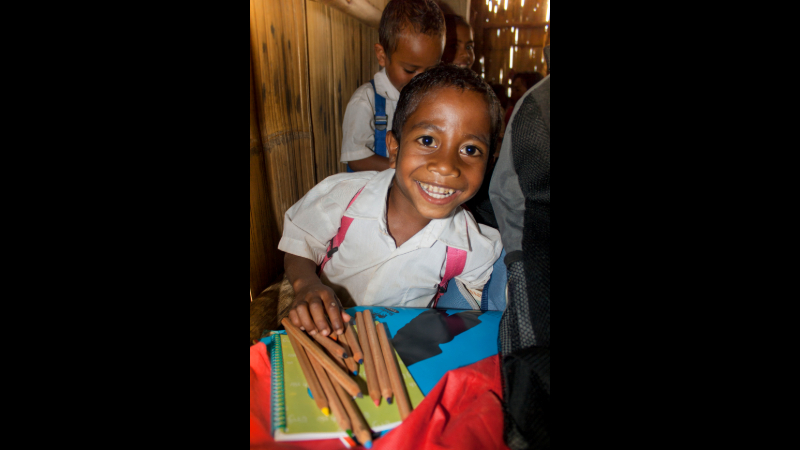 The Kit-4-Kids programme sees students from wealthier schools prepare a backpack of school supplies, toys and a note. Replanking the heavily damaged port side. Let’s rally round this good cause and get Vega out on the waves once more. It’s 1992 in the fjords of Scandinavia and Vega is dropping off her last cargo after 100 years of hauling engines, generators, cement, building stone and pig iron in the North Sea and the Arctic. 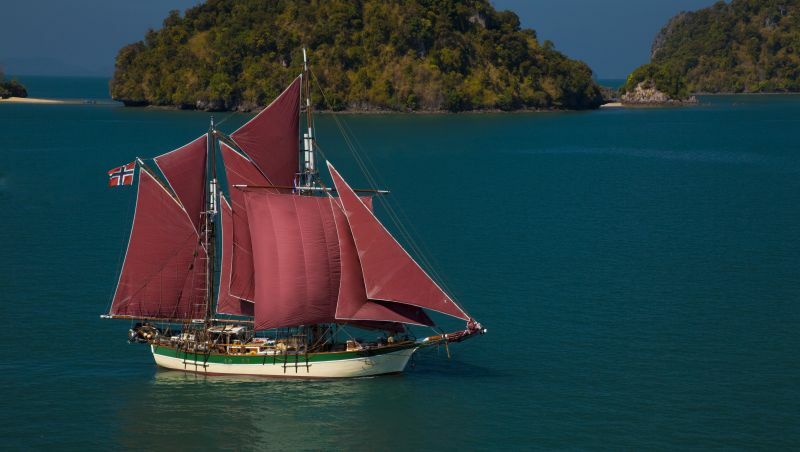 It’s 2004 in tsunami-hit Sumatra, Indonesia and Vega’s new owners, Captain Shane Granger and his partner Meggi Macoun, are using her to deliver food and medical supplies to those in need. It’s 2019 in a dock in Satun, Southern Thailand and, after another successful trip delivering supplies to remote communities in Southeast Asia, as she has been doing since 2004, Vega is being hauled out for annual dry docking. Then disaster strikes. She falls from her cradle, port side, and is severely damaged. 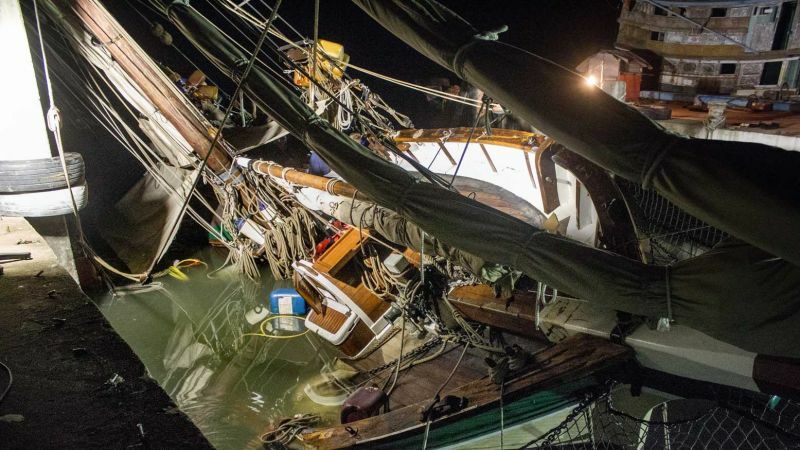 When righted, she falls starboard side and is com­pletely flooded. Not only do Shane and Meggi lose part of their yearly supply of aid, but their personal possessions too. 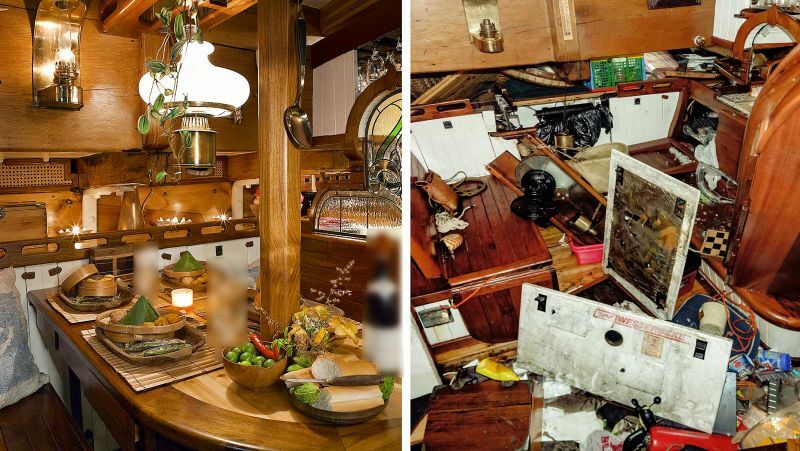 “The hull and rigging were not so seriously in­jured, but the interior was completely flooded. We managed to save Scourge (the cat) who found the only unflooded space to hide in. Other than that, we lost just about everything we owned. Clothes, computers, cameras, our beloved book collection, artwork. We are completely devastated,” says Shane. However, the couple remain positive in the face of what must be a boat owner’s worst nightmare. “Thankfully, she is a strong old bird. We are deter­mined to get ourselves and Vega back in shape. There are so many people who depend on us and we do not want to let them down,” he adds. To see such determination and grit from Shane and Meggi hardly comes as a surprise; it takes a cer­tain spirit to leave loved ones and a six-figure salary for a life of humanitarian work in uncharted waters. When the couple discovered Vega in the Canary Islands, she was in a state of total abandonment, dried out in the harsh tropical sun. “The fellow who had her before may have been a great butcher or baker but he was not a sailor. The interiors looked like a cross between an Afghan goat shed and an African chicken coop!” says Shane. The initial refit took four years and saw no cor­ners cut; Meggi designed the entire interior layout, creating a blend between the 1800s and the present day that was both faithful to the past but functional too. Only recycled materials and local Indonesian labour were used during the refurbishment, includ­ing teak and other tropical wood from old houses and broken boats in Bali. 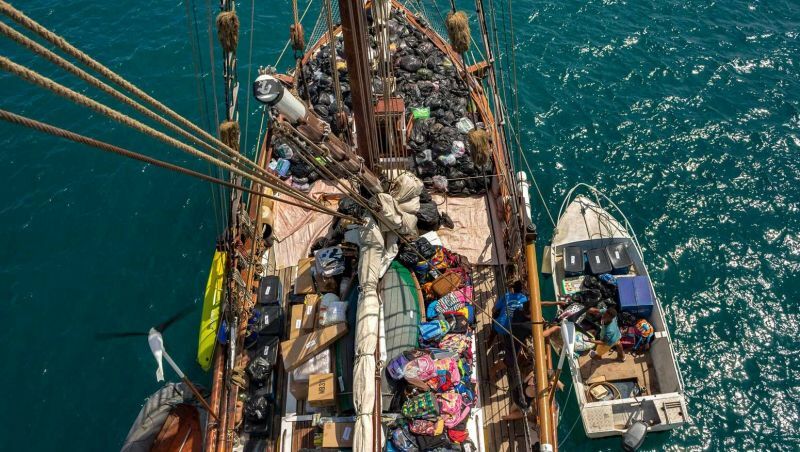 Every year, Vega embarks on her 6,000-nautical-mile ‘mission of mercy’, spending five months gather­ing 15-20 tonnes of donated educational and medical supplies from Thailand, Malaysia, Indonesia and Singapore, and five and a half months delivering them to East Timor and remote islands in eastern Indonesia. Shane and Meggi assist 34 communities and sup­port 23 health posts, 122 traditional midwives and 42 local community-built schools across 18 islands. “Often it’s the small things that make a big differ­ence to the standard of living for these isolated island communities. A small bag of fishing hooks, fishing line, knives, nails, hammers, cloth and sewing mate­rials, shovels, metal buckets, cooking pots, vegetable seeds,” explains Shane. A fully qualified Indonesian doctor, Dr Ruth In­dira, also travels with the charitable cargo and crew. She provides medical services, leads dental hygiene classes in schools and holds workshops and training seminars for traditional midwives in these remote communities. Her efforts have contributed to what must surely be the Vega team’s greatest achievement: reducing maternal and na­tal mortality within these communities by over 50% in three years, living proof that none of us are too small to make a difference. The importance and impact of this work cannot be underestimated. For many communities, Vega is a lifeline to the rest of the world. On arrival to these remote islands, the boat is surrounded by beaming locals ready to greet the team before anchor has had a chance to meet sand. However, unlike the past 15 years, many of these communities won’t see hope on the horizon in 2019. “We are working on plans to ship some of this year’s humanitarian deliv­eries by container and Meggi will fly to East Timor for distribution. But we can’t think of any way for now to get supplies to the smaller islands. Unfortunately, we will be unable to assist the smaller, more remote islands or deliver medical supplies this year,” explains Shane. Shane and Meggi’s humanitarian work relies solely on the assistance of volunteer crew members and private and corporate supporters. During more challenging periods, they can find them­selves moored for days at a time, waiting for the next fuel top-up or food shopping money, so last month’s disaster has been a huge blow. However, they march on, hoping that by doing the right thing something will turn up. And, so far, it has. 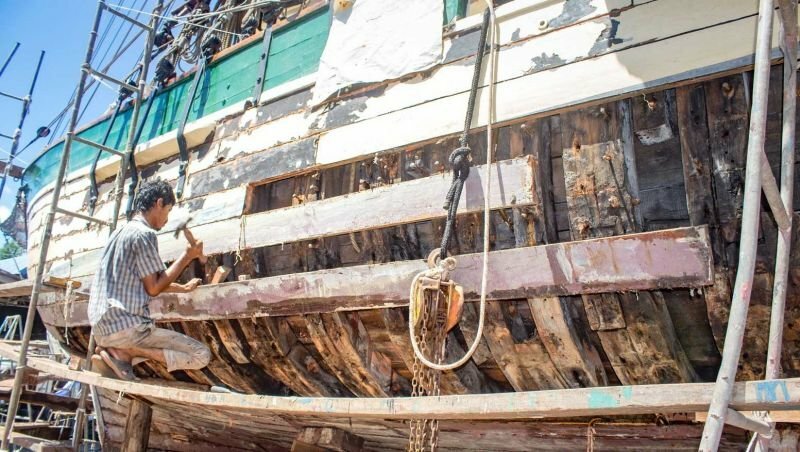 A surveyor evaluation estimates that it will take three months of long, hard work and US$150,000 (B4,754,960) to restore Vega to her former glory; Shane and Meggi must find US$32,000 (B1,014,391) of this to make up the shortfall and replace equipment and supplies that are not covered. “Much depends on how many holi­days fall in between. Delays awaiting parts and materials will also play an important part,” Shane says. 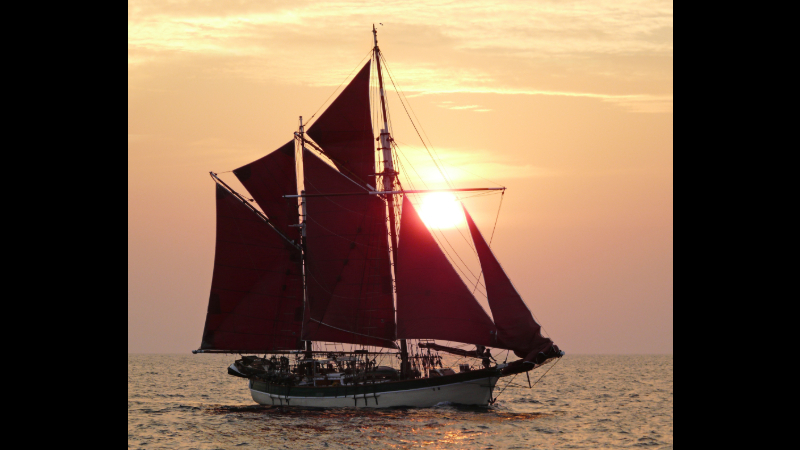 Donations can be made through the Sail Vega website and all funds are gratefully received. Shane and Meggi also seek those with expertise and con­tacts in the Phuket marine industry; as almost all of the boat’s systems need replacing, accessing equipment at cost price would be a great help. Once Vega is shipshape once more, which the couple are confident she will be in time and with the right hands on deck, they welcome Phuket international schools to engage with ‘Kits-4-Kids’, a programme in which students prepare a backpack stuffed with school supplies (from a provided list), an additional toy or stuffed animal, a photograph and a note about themselves and where they live.